With the official start of Spring on 1 September, the most effective way to keep your garden looking good and get the best out of your plants is small but regular upkeep of your outdoor spaces throughout the spring. “Plants flourish during the warmer months; however homeowners often don’t know when to prune their garden to achieve the best results. Pruning the wrong plant at the wrong time can jeopardise flowering displays and pruning too much or too little can impact on the whole look and feel of your garden,” says Tristan Eastaugh, product manager at Cyclone. Cut early bloomers, like lilacs and forsythia, in late spring as soon as they finish flowering. If you prune too early you’ll remove flower buds and sacrifice the display. 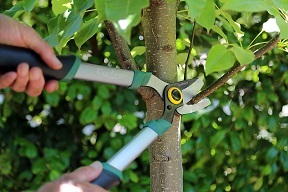 For woody material that is harder to cut through, use a Cyclone Compact Bypass Lopper (RRP $27.98), which allows you to get through thicker stems with little effort and achieve maximum results. More than just a tidy touch, a hedge can provide privacy and screen out unsightly views to help create a tranquil space in the garden. If you want a tight, close-knit hedge, it is best to prune little and often and start clipping plants when they are young to encourage compact, bushy growth. To achieve good even cover keep the top of the hedge narrower than the base. If you prune on a subtle angle the upper branches won’t shade out the bottom. 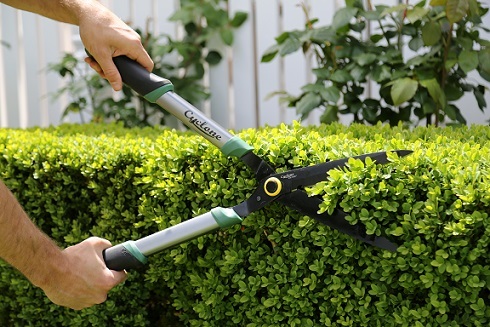 Use a pair of Cyclone Heavy Duty Straight Hedge Shears (RRP $39.98), with contoured grips and straight blades for a nice neat finish. Informal hedges can be clipped less often to allow the natural shape of the plants to shine through. Always prune flowering hedges after they have finished blooming. Not everyone has a green thumb, but spring is a time when even beginner vegie growers can’t go wrong. Tomatoes, eggplants, capsicums, chillies and sweet corn can all be planted in spring when the risk of frost has passed. 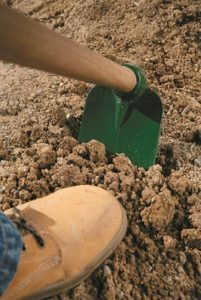 Prepare garden beds for planting by digging plenty of compost and organic matter through the soil. I like to use a Burr Hoe (RRP $65.99) to really work the organic matter into the soil. If you’re short on space try growing compact vegies like bush or cascading varieties of tomato, leafy greens, chillies or capsicums in sunny pots. Keep a set of small tools handy for planting in containers and small spaces. 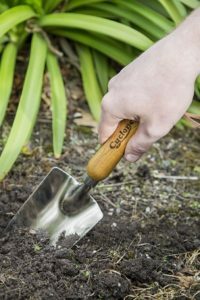 I like to use a Cyclone Stainless Steel Bulb Hand Trowel (RRP $9.98) to make light work of planting. Fill outdoor pots with new season bloomers like petunias, vincas, impatiens and snapdragons, which produce stunning flowers through the warmer months. Be sure to remove any old flower heads regularly with a pair of Cyclone Floral Snips (RRP $13.98), as this stops the plant from setting seed so it can direct its energy into producing new buds. “With a little bit of care and regular maintenance, you can have your plants looking healthy and tidy, show off the real potential of your garden this spring and set you up for a great summer,” concludes Eastaugh. The Cyclone garden range comes with a lifetime warranty and is available nationwide at Bunnings Warehouse Stores and all good garden and hardware retailers.